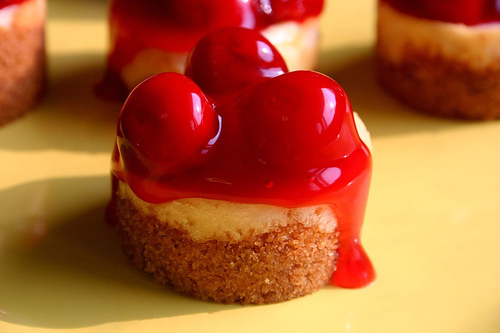 No, I can’t give you the Mini Cherry Cheesecakes (as much as I’d like to!). But, although I’m a little late for Hanukkah and a little early for Christmas, I do have a holiday gift for you! It is the addition of printer-friendly versions of my recipes. It will take me a while to update every single post but I have added a link to the bottom of a few recipes that will take you to the pdf version. As long as you have Adobe Reader installed on your computer (and I’m hoping most people do), it will be easy to view and print! Hopefully this will be a little easier than the copy and paste method that some of you may have been using before. Please give me feedback as to how well it works! Thanks so much to emonome for helping me to figure out how to do it! When it comes to the technical aspects of maintaining this site, I am not very knowledgeable. Ok, that’s an understatement. So it’s always nice to find people who are willing to share their knowledge and expertise! Good idea, Nicole! Just stopped in to sayMERRY CHRISTMAS!! Merry Christmas to you Sandy! Give ol' Smack a big hug for me! Happy Holidays and Merry Christmas girl! I love the printer friendly idea! Very cool! I'm a newcomer to your site (in Italy, too) and I look forward to seeing more of what you make! You have some gorgeous pics on Flickr. Auguri! Alicat: Will do! I wish you and yours a Merry Christmas too!Rachel: Thanks! I hope that it's helpful!Sara: Thanks a lot! Buona festa! Those little cheesecakes look incredible. I love your photos. Merry Christmas! WOW. I LOVE the new digs!Merry Christmas and Happy New Year, too! how thoughtful of you! thanks for the printer-versions. and i like your new holiday theme, very pretty! Merry Christmas and I can't wait to read your fabulous recipes next year too! very lovely! Love them all Merry Xmas to you! Hi Nicole, Thanks for the mention! Expect me to download bunch of recipes from you.A very Merry Christmas to you! Kristin: Thanks, They do taste really good! Merry Christmas to you!Connie: Thanks for stopping by! Merry Christmas!Ruby: Hi, I hope you try these! Hopefully I'll be home next year at Christmas! Tell your family Merry Christmas for me and give Emma a big hug and kiss!Ivonne: Thanks! Buon Natale!Abby: Thanks! Merry Christmas and happy new year to you also!Bea: Merry Christmas to you! Thanks for stopping by :-)Emon: You're more than welcome! You have a great site and it's been very helpful to me! Take care and have a merry Christmas!! Your blog is so festively decorated right now! I'm always afraid to play around with colours and such on mine because I'm not tech savvy enough to fix anything if it goes wrong. So I'm boring, and my blog stays white.I love that pic of the cheesecake! this is wonderful. thanks so much for making your recipes available in this way. they all look so good. merry Christmas to you and yours! All I can say is that everything looks de-lovely! Photography is TOP NOTCH! Merry Xmas or Mele Kalikimaka as they say in Hawaii! Merry Christmas, Nicole! so many people are giving such great holiday gifts out on their sites! i come empty handed but want to send you the best of wishes from the other side of the pond!